In a study at Northwestern University, Dr. Morimoto and team found that a certain strain of worms begin the downhill slide to aging when they reach their equivalent of puberty. It seems the same gene that causes this effect is also present in humans. Implication (still being studied): perhaps there is a way, using biochemical and genetic methods, to switch the mechanism that sends the signal: “time to start aging!” That is, to reverse the aging process, perhaps opening the way to radical life extension. Is there a way we can prevent that aging switch from flipping—or, even better for the rest of us, flip the switch in reverse? Is it a valid step toward reversing the aging process, even toward human immortality? Who knows? Stay tuned. The header tells it all: "Organs Made to Order: It won't be long before surgeons routinely install replacement body parts created in the laboratory"
This is from the Smithsonian Magazine, and provides a brief overview of the work being done in human organ regeneration by one of the leaders in the field, Dr. Anthony Atala at Wake Forest Institute for Regenerative Medicine. You'll pick up a feel for the approach and the terminology, and will also see some excellent photos of the work done, like this regenerated ear-in-progress. Example: about a week ago, the Wall Street Journal ran a short piece by Daniel Akst, "Tissue that's fit to print" on some new work at Harvard (and a book describing that work) on the subject of using 3-D printing to create layers of tissue based on human cells. The difficulty, until this work, has been in printing a vascular system to nourish the new tissue. Another example: yesterday I was reading through Bloomberg Business Week (March 24-31, 2014) and came on Caroline Winter's article "Printing Medicine" on Andrew Hessel and his work at Autodesk, where theyare designing software that may help bring about cures for cancer . . . and who knows what beyond. Part of the work is done in conjunctioin with a startup named Organovo, which "uses bioprinting technology to manufacture human tissues" (see paragraph above). Sorry, at this point I am unable to find the online link to the article (I read it in my old-fashioned print copy!) but I expect it will be up on Google or Bing before long. 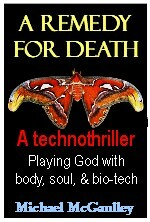 I'm running short of time at the moment, but plan in another post here to make the link between my technothriller, A REMEDY FOR DEATH, and how it integrates much of this new medical technology. (If I may modestly say so, the early drafts of REMEDY had concepts that pre-figured what we're reading now! And there is still stuff in REMEDY that is way ahead of the curves of bio-tech, human stem-cell technology, the mystery of consciousness, neuroscience, tissue engineering , synthetic biology, regeneratiove medicine, the quest for immortality-- and the ethical and legal implications of putting all those pieces together.